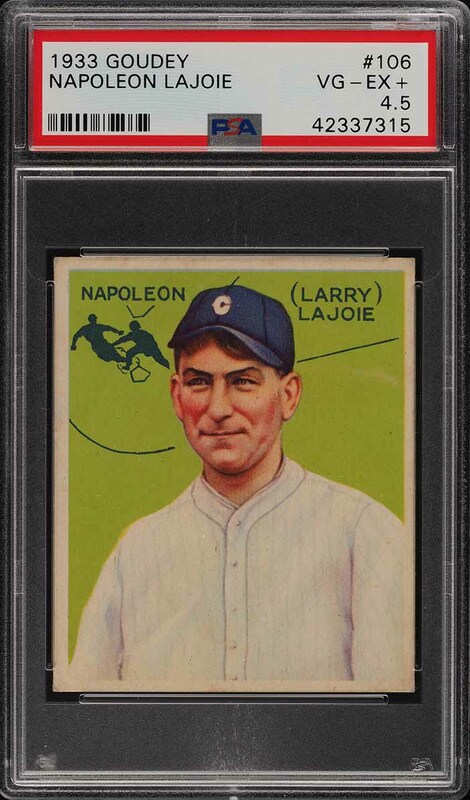 A world class offering from the pre-war era and largely representing the finest of high profile trading card investment opportunities. 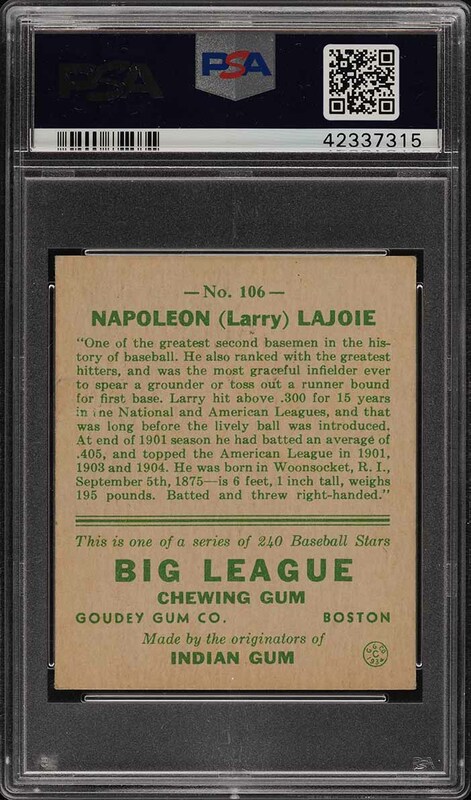 The 1933 Goudey Lajoie is a true market rarity, limited to approximately 100 copies ever produced and actually manufactured in 1934 by the Goudey Gum Co to address the glaring (and purposeful) omission of card #106 from their 1933 production run. Those few copies produced were added to the 1934 print sheet and were then hand mailed to those limited individuals who complained to the manufacturer. Each was paper clipped to a letter from Goudey and sent through the US Post Office. Interesting to note that the offered specimen up for auction still shows very faint indentures on the reverse right edge surface where the paper clip once resided (a cool piece of lineage tied to this masterpiece). Imagine the glee experienced by that vintage collector who finally received their missing card #106 in the mail during the Great Depression (!). This card shows glistening color and wonderful overall preservation for the issue with only light corner touches and mild other signs of circulation throughout. Those in search of a solid mid-grade example of this hobby critical asset need look no further. We are delighted to present this card to the investment community, free of reserve or other restrictions. Don't miss it. 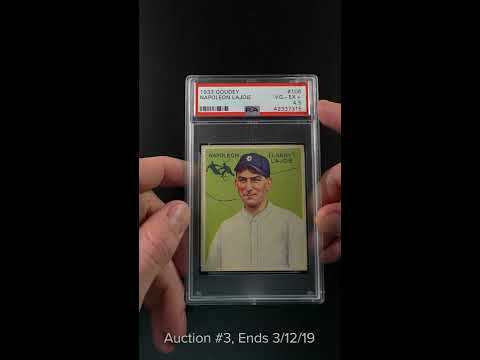 One of over 17,000 cards, lots, and sets up for bid in our 3rd Auction of 2019. Click on the link above to view the other PWCC auction lots. The PWCC Vault is now live! Open a PWCC Vault account and receive a custom Vault shipping address. Purchases shipped to the Vault receive free shipping and reflect Oregon's 0% sales tax rate.